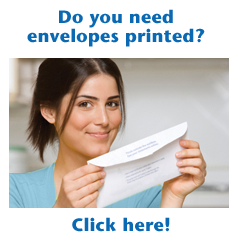 Envelopes are available in many different sizes and types of paper. They can even be custom-made to fit that special size or shape. Request a Quote or Consultation to discuss custom envelopes. Castle Press stocks a range of standard envelope sizes. It's a good idea to choose an envelope that is about 1/4" larger than both the height and the width of the piece you are mailing. This allows for easy hand insertion but controls possible damage to the enclosure by minimizing excess space. If you are planning to utilize automated inserting equipment plan to use envelopes that are 1/2" wider than the largest piece to be inserted. Postage is a major cost of any mailing therefore consideration must be given to the size of the envelope and whether it will mail as a letter or flat rate. Letter rate postage is about half of the flat rate postage. These envelopes have a square flap. Some have deckle edges. Because they are available in many colors and finishes with matching text and cover papers, they are good choices for announcements, informal invitations, booklets, and brochures. When selecting papers to be used for this type of project it is always best to choose an available envelope rather than choosing the invitation stock first. Invariably when you chose the invitation stock first a matching envelope is not available. (There may be a minimum order quantity for matching papers.) Typical weight for paper used is 70 or 80 pound book. Announcement envelopes are boxed in 250's. These envelopes have a pointed flap. Baronial envelopes and cards are used primarily for formal business and social purposes. Matching enclosures can be ordered with or without a raised border panel. Color selection is usually limited to white and off-white. A production disadvantage is that the baronial envelope cannot be inserted or sealed on automated inserting equipment, which means mailing operations must be completed by hand. Typical weight for paper used is 70 or 80 pound book. Baronial envelopes are boxed in 250's. Used for personal and business correspondence including letters, statements and involves, and for reply mail, these envelopes also can be ordered with standard die cut windows. Because of USPS postal requirements special consideration of size and positioning of the window must be made. Discuss with Castle Press your mailing and addressing requirements to make sure that all USPS regulations are being met. Many number 10 envelopes are color matched as part of a letterhead package. Typical weight for paper used is 24 pound bond or 60 pound book. Commercial envelopes are boxed in 500's. Also known as "open-sided" envelopes, booklet envelopes are used in high volume mailings because they are machine insertable. They can be ordered with a self-sealing option, and in durable synthetic papers. Typical weight for paper used is 28 pound bond or 70 pound book. Booklet envelopes are boxed in 250's and 500's dependent on envelope size. Also known as "open-end" envelopes, these generally require hand insertion of enclosures. They can be ordered with a self-sealing option, and in durable synthetic papers. The center seam makes this style more suitable for mailing heavy-weight material. Typical weight for paper used is 28 pound bond or 70 pound book. Catalog envelopes are boxed in 250's and 500's dependent on envelope size.